1. Soil Microbial analysis – Soil microbial analysis carried out for isolation of different microorganisms by serial dilution method, growing and multiplication of microorganism on artificial media and finally identification of microbes under microscope for its general characters. On the basis of general character and gene sequencing final identification of microbes can be done. 2. 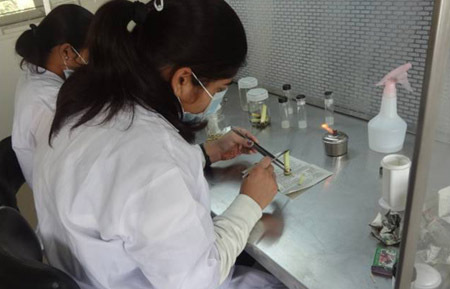 Plant Disease analysis – Plant disease analysis mostly carried out by section cutting, slide preparation and identification of general characters under microscope. 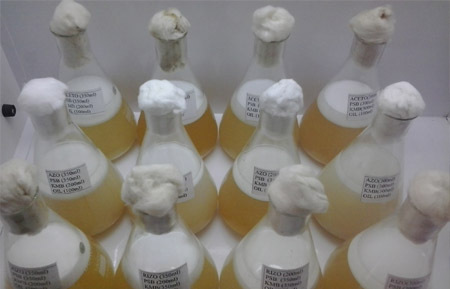 Also growth characters can be identified on the basis of inoculation of pathogenic plant sample on artificial media and identification under microscope for growth characters. 3. Soil Nematode analysis – Soil Nematode analysis mostly carried out by sieving method of nematode infected soil sample under different sieves and final inoculums solution can be examined under microscope for the growth characters of Nematode. 1. Soil nutrient analysis - Alkaline fermagnet method for Nitrogen analysis, Olsten method for phosphorus analysis, Ammonium acetate method for Potassium analysis, Calcium carbonate method by rapid titration method, pH of soil by pH meter and Electrical conductivity of soil by EC meter. 2. Water nutrient analysis – Ca+Mg by using EDTA solution method for analysis of available nutrients of water, Carbonates and Bicarbonate methods, pH of soil by pH meter and Electrical conductivity of soil by EC meter. 3. Plant nutrient analysis – Digestion and extraction method, Diacid and Triacid (DTP) extraction method for analysis of micronutrients and calcium chloride method for sulphur analysis. 1. Milk Replacer – Analysis on effect of Milk replacer on early weaned calf on basis of field trials on different calves. 2. Fodder analysis – Fodder analysis by proximate analysis method for the analysis of total digestible nutrients. 3. Blood analysis – Blood analysis by Microscopic observation, ketone and jaundice analysis by chemical methods, pH of blood by pH meter. 4. Urine analysis – Ketone and jaundice analysis by chemical methods, pH of Urine by pH meter. 5. Milk analysis – Centrifuge method for fat, Titration method for acidity, Calculation method for Solids Not Fat and Total Solids and specific gravity by lactometer. 1. 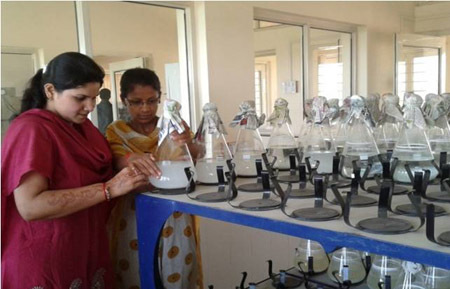 Raring of Parasitic insect – Raring of predators and parasites in vivo and vitro conditions in raring cages, trays and on sticking cards etc.